This last Thursday Think Galactic discussed Nike Sulway's 2013 novel "Rupetta", which is the most recent winner of the Tiptree award. A good read, and a good discussion! 1.) Spoilers beware! I won't go particularly out of my way to hide plot points about already-discussed books. 2.) Unattributed borrowings! Some of these ideas and thoughts may have influenced or stolen whole-cloth from things other people said at group. For which I apologize! And will attribute when possible. But these are just the thoughts percolating in my brain afterward. 3.) That said: I take full responsibility for anything offensive, incorrect, etc. below. Everything posted here is on my blog, don't blame the author of the book, the book discussion group or its members. So first off, gotta say, the writing in Rupetta is gorgeous. Sensual, lots of bodily stuff going on, lots of hands and wrists and hearts pulsing. In some cases ticking. The novel is two separate threads, Rupetta's bit--which is historical, zooming in on certain sections of her long life--and Henri's, who is a more normal human-type person, a student, a researcher. Both threads are written in first person. Rupetta's sections are more lyrical, given to gushes of metaphor, intense feeling, and a strange, inventive sense of the fantastic. The pontoon city in the desert, in particular, felt like it would have been at home in Tachyon's New Weird collection. Large chunks of Rupetta's text are also directly addressed; having we the readers stand in for that "you" is something I find very effective if done well, and it's done well here. Henri's sections are more down-to-earth, and more journal or diary-like, with the fantastic intruding only occasionally. But her life and story are what pulled me through, as much as the magic/clockwork/secret history of Rupetta's story--Henri's world is more fleshed out, her relations more comprehensible and compelling. I could talk more about the writing--a few things in particular put me strongly in mind of Jeanette Winterson, which is close to the highest praise I can give--but suffice it to say for now that at a lyric, word-and-sentence level of writing, Rupetta is very satisfying. But--and given how much I liked the book I hesitate to say this so flatly--I can't escape the feeling that this book is a PHENOMENALLY BRILLIANT...first draft. One that didn't get enough structural criticism and re-writing. There are issues that seem like flat-out errors: losing track of number of people in a given scene, or someone's name from a sentence or two ago. Sulway's action sequences are really problematic; when not difficult to construct in one's head they seem to take far too long; characters behave unrealistically in space and time. Also they seem to take place in curious silence. I tried repeatedly to wrap my head around the universe of the book, and failed. I'm not entirely sure that's a failing of the book--shifting narratives that don't correspond to a flat conventional narrative can work--but I suspect it is. This is a story that starts in the 1600s in France, that repeatedly touches in with actual figures and places from "the real", so one says: "aha, this is an alternate history, where the event that splits the timeline is the creation of a thinking, mechanical being and the technical and social changes that follow her." But then--but then. There are confused references to the "northern" and "southern" continent, as well as Europe. Lots of little details confused me as to where and when the action was taking place--whether on an Earth that's geographically like ours, or a fantasy setting that has different geography as well as history, that includes things like the floating city. Things that MUST BE HUGE in the alternate timeline receive no attention at all, so it's a little hard to keep disbelief suspended--like the Rupettan religion/expansionist Russian empire taking over...everything? Also, what the heck is the Oikos? Is it a place? An ethnic group? A religion? So there seems to be some confusion at the world-building level, I had some issues with the timelines, the action scenes are pretty awfully-written, and there are a few plot points that stretched credibility a bit too much--key for me being that one could be in love with, and indeed make love to, a partially-clockwork robot without noticing any of the robotty bits. That said, again: beautifully written for the vast majority of the book. It's got echoes of Russ's "The Female Man", it has a LOT to say about History, Truth, and Narrative. It's full of interesting ideas, some of them quite subtle. There's this whole "Rupettan" religion in the book that seems (it's mostly in the background) to combine the Buddhist notion of life-as-suffering with a very cyberpunk disdain for the meat, for the body. 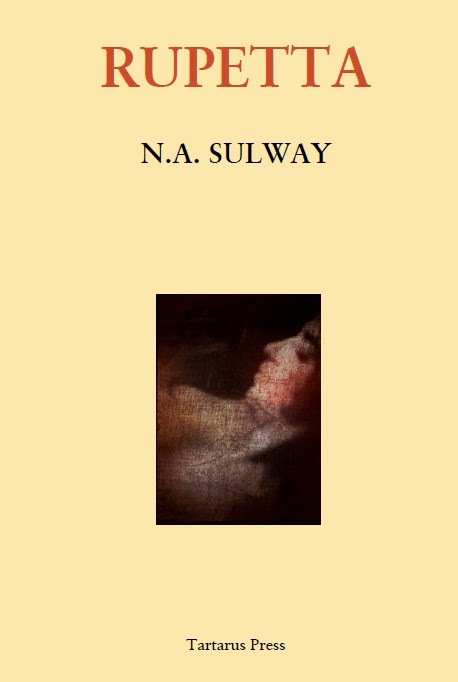 She comes at it from an interesting angle, but I think what Sulway is doing is going after the flaws of Cartesian dualism, which are deeply entrenched in Western culture at least, and which have strong ties to both our love affair with technology and persistent misogyny. And there's a good love story in there! And lots of odd personal bits and touches. Highly recommended, and I'm curious to see what Sulway does next. It's also worth reading Sulway's Tiptree acceptance speech if you haven't-- ties together some thoughts about Descartes, body/mind issues, and feminism, which are good thoughts to have. Also John mentioned that some of these may veer into erotica, so if that's an issue for your blushing eyes: fair warning. December's meeting will also be Selection Time for the next 6 books we read, so come with good ideas! Thursday, December 11th, 7:30pm at Myopic Books.